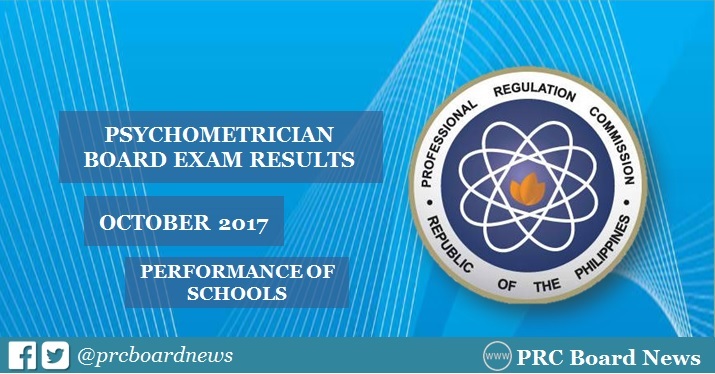 MANILA, Philippines - The Professional Regulation Commission (PRC) recognizes the top performing schools in the October 2017 Psychometrician board exam. The result was released on Tuesday, November 7, 2017 or in four (4) working days after the exam. University of the Philippines (UP) - Diliman topped the board with 97.67% or 84 out of 86 passed the exams. It was followed by University of Santo Tomas (UST) with 96.53% or 139 out of 144 successfully hurdled the tests. In the August 2016 Psychometrician board exam, University of the Philippines (UP) - Diliman topped the schools with 98.39% or 61 out of 62 examinees passed. University of Santo Tomas (UST) ranked second with 91.86% or 158 out of 172 successfully hurdled the tests. In the July 2015 exams, UST was the lone top performing school, 89.25%, 166 out of 186 passed. ang tagal! anong petsa na!!! Anu na? San na result? I bet you haven't passed the board? Very unprofessional. anu may chuchurvahin ka na ba? pasado ka ba? i bet wala hahahahahahahahahahahahaha. bastos!!!!!!! Bkt ag tgal ng result...ano b yan mas lalo tuloy ako kinakabahan sa result ng kapatid ko....panay tingin ko sa goggle lagi nmn updating ..
Ilabas niyo na ang dapat ilabas. Sumunod kayo sa oras ng commitment niyo . kung may iaadjust kayo i adjust niyo na. Very well going performance. This result satisfied the parents and participants also so we should see more details here to know the more programs for admission. Awesome post. I am thankful to follow the link which you provided here. This result is really an example of good studies. The performace of schools depends on exams result. I can check it from many ways so i just hope things will gonna more better.